A collective and forward looking trio formed in 2015, playing material written by each member of the group. The compositions have a unified written language stemming from the european jazz tradition. Heinen's roots in impressionistic classical music are complimented by Michele Tacchi's lyrical fretless sound and the wide dynamic range of Riccardo Chiaberta's sensitive approach to the drums. Laura Holland is an exceptional singer. Double-award nominated, she is inspired and energised by the classic sounds of Chess and Stax Records, including Otis Redding, Jimmy Reed, and many more. If you enjoy Imelda May, Billie Holiday or Etta James, you're sure to love Laura, whose "impassioned vocals delight" [The Blues magazine]. Tonight Laura appears with a glorious 6-piece band with trumpet and sax. Already featured on the covers of music magazines, Laura is an established festival favourite. John Emil Montagnino, an accomplished singer/songwriter, guitarist, and a master of slide guitar, has delivered show stopping performances at major music festivals like the Telluride Blues and Brews Fest and the 2012 Zoetemeer Blues Festival in the Netherlands. We're thrilled to have John visit us during his brief tour of the UK. Expect a night of blues and American roots music, traditional and original compositions, played on acoustic Hawaiian Lap steel guitar and Dobro. Del Bromham is best known for his work as singer/guitarist/songwriter for the now legendary UK band STRAY. Del Bromham’s Blues Devils, like a chameleon, can take many forms, from a basic guitar bass and drums three piece, up to a seven piece band which often features his good friend and fabulous vocalist Cherry Lee Mewis. Cherry featured on his last studio album titled ‘Nine Yards’ which received excellent reviews by the music press and fans alike. For the performance at The Bear, Del’s Blues Devils will play as a trio featuring Stuart Uren on bass guitar and Karl Randall on drums. Del will start the show playing a selection of songs on acoustic guitar building to the electric guitar trio format. Del Bromham’s Blues Devils have recently played some major festivals going down a storm at every show. 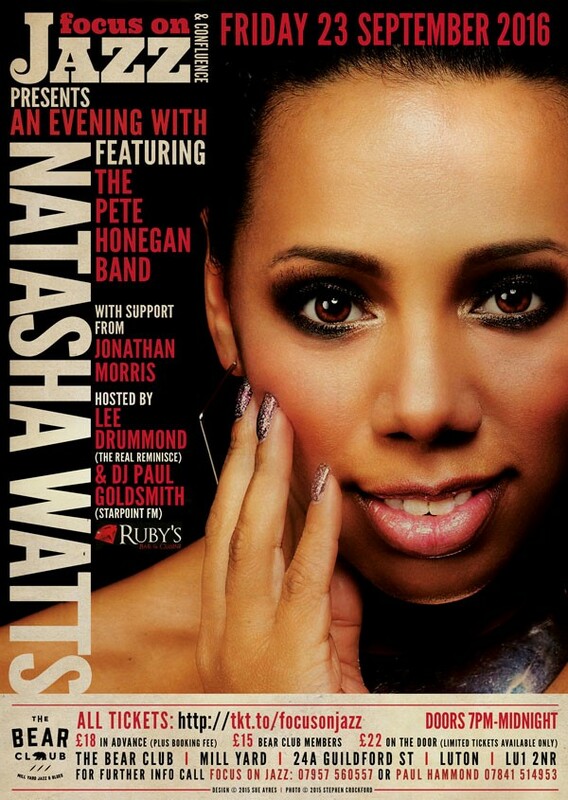 The UK’s premier female vocalist on the underground soul scene comes to Luton promoting her new album “Second Time Around.” Having played at venues such as the Royal Albert Hall, London’s Jazz Café as well as the Montreux Jazz Festival, Natasha is making a rare appearance with a full live band. Support is provided by Luton’s own Jonathan Morris. The keyboardist and composer is making his live debut and is performing a range of jazz and gospel favourites. This show will undoubtedly be another sell-out for Focus on Jazz @ The Bear Club so make sure you don’t miss out and secure your tickets early. 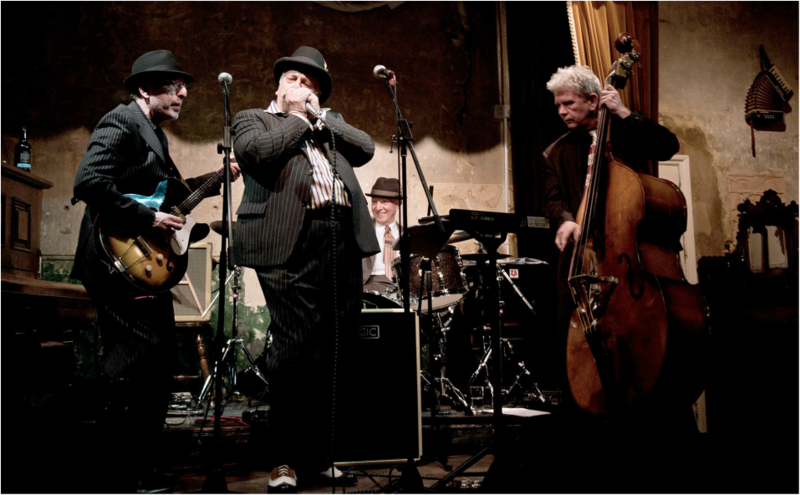 Nigel Price is a regular performer at Ronnie Scott’s where he has racked up over 500 performances. He spent three years with the James Taylor Quartet and has performed with the BBC Big Band, Carleen Anderson and the legendary David Axelrod. His blend of flowing, fiery bebop lines, deep blues feeling and his will to swing hard has made him a big hit with jazz audiences everywhere. He is joined by legendary drummer Steve Brown and the incredible organist Ross Stanley. Renato D’Aiello has become known as one of the strongest and most beautiful saxophone sounds around. His treatments of jazz standards, and originals, both live and on cd, have won great admiration from audiences and the press. Since July 2010 Renato has been running a very successful Monday night upstairs at Ronnie Scott's in London and he performs regularly at Pizza Express Dean Street in London and many other of the best clubs in UK. Back in quintet form after his sell-out Bear gig last year.